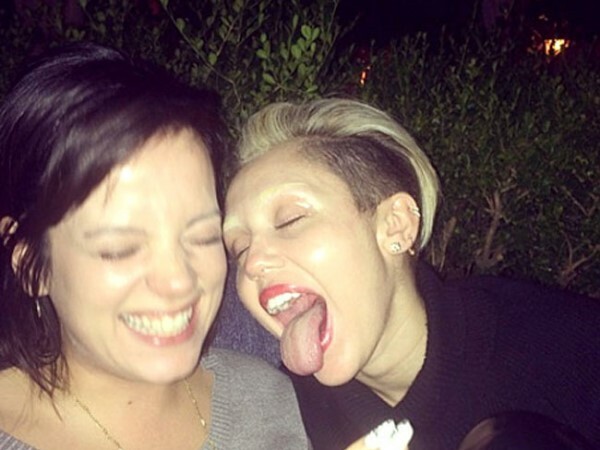 Lily Allen has joked she wouldn't say no if Miley Cyrus tried to kiss her during her upcoming London concerts. Lily Allen would kiss Miley Cyrus. The Air Balloon singer is seen smooching her own doppelganger in her new video Our Time and admits she would also lock lips with the controversial pop princess if the occasion arose during Miley's London concerts. Miley hit the headlines in recent weeks for her wild antics during her current Bangerz world tour, planting a kiss on VIP guest Katy Perry in front of an audience of thousands in Los Angeles. Quizzed on what she would do if the 21-year-old star tried to kiss her, Lily laughed: "I'd probably reciprocate." The 28-year-old star has made a big comeback this year after announcing she was quitting music in 2009 to raise a family with her husband Sam Cooper, with whom she has Ethel, now two, and Marnie, 14 months. Nowadays, Lily says her family is her support system and keeps her grounded amid all the craziness of the showbiz industry. Lily added in an interview with TheDebrief.co.uk: "On the surface of it I am happy... I'm quite grounded, and I've got a really lovely husband who looks after me, who I can speak to five times a day and who reminds me why I'm doing what I'm doing. "I've got two beautiful children and I have to check myself sometimes and think, 'This is weird.' It could consume you and make you go quite strange, but I try to not let it."